The Kitchen Work Triangle: Concentrate on its Points! Discover how Workstations can help make the work triangle more efficient. 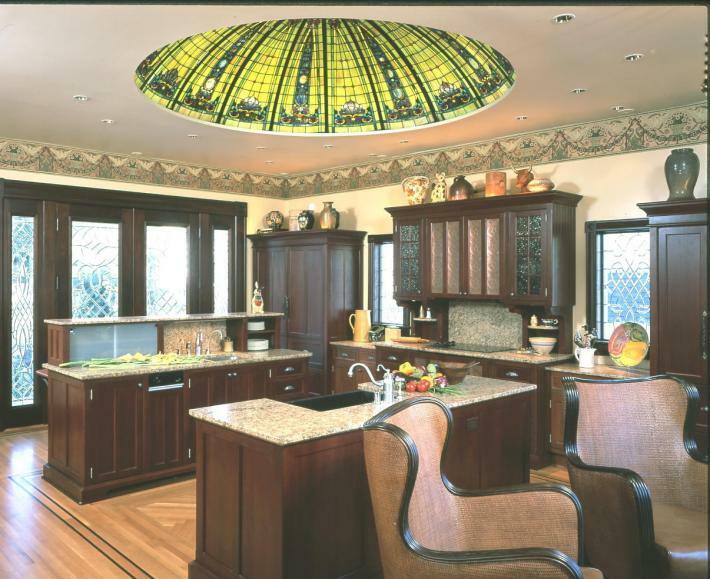 The Kitchen Work Triangle is often mentioned as the most efficient way to design a kitchen. It is generally thought that by keeping the sink, range and refrigerator as the points of the triangle, and filling the spaces between them with two foot deep base cabinets, wall hung top cabinets and continuous counter tops, an efficient kitchen is virtually guaranteed. Back in the 1950’s when kitchens did not open up into the living areas of the home, the size of the work triangle was quite small and very workable, but the cook was isolated from the family. Later on as the housewife became a working mother, the kitchen became more open to the living areas of the home. First the breakfast area and then the family room were exposed to the kitchen as a direct attempt to keep the cook in contact with the family. But lately, as kitchens have become larger, multi-purpose, live-in, social rooms, the triangle has grown to proportions that make it much less effective. The expanse of continuous counter tops is getting longer between the points of the triangle. Islands that are used to help blend the kitchen into the adjacent living area are so big that they often block easy access to the refrigerator or built-in ovens. Counter space immediately adjacent to the ubiquitous stainless steel range is severely compromised by the ‘Hearth’ design that features cabinetry that rests on the countertop. Top cabinets that rise to the ceiling are impossible to access, and store only the items that are rarely used. All of this boils down to more walking while preparing meals, more areas to clean up and keep clean and more storage areas that accumulate seldom used items. In a time when our active lifestyles translate to less time to prepare meals, it would seem that an efficient work triangle would be even more important. But just as critical as the size of the triangle is what actually happens at its points. Even in our smallest kitchens, if the cook repeatedly must walk from point to point and all the areas in between, then the efficiency around each point of the triangle is lacking. freezer shares an armoire with a dry goods storage. The range piece features concealed ovens when they are not in use. 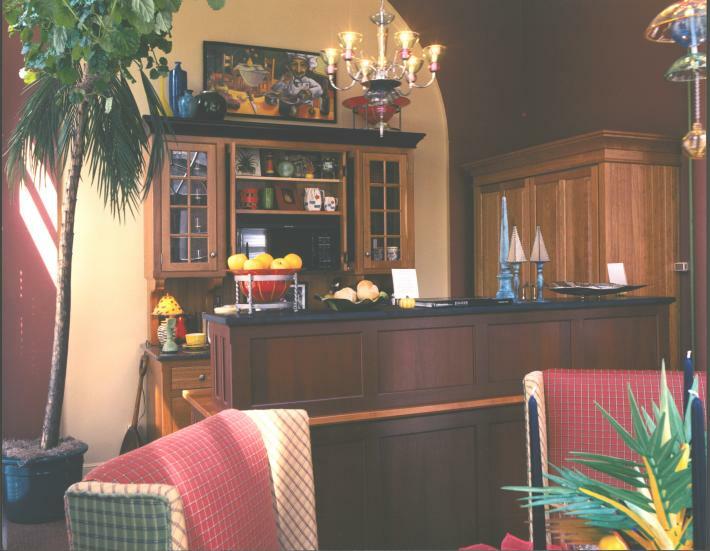 A workstation can be made of cabinetry and counter tops. Or it can be a freestanding piece of furniture. Or it can be a freestanding or built-in appliance. But it always must be more efficient than normal cabinetry, counter tops and appliances. The efficiency of the workstation is measured by how much counter space and storage area is available directly around each of the three major points of the triangle. YesterTec specializes in manufacturing Kitchen Workstation Furniture, and can create complete kitchens with only 3 pieces of super-efficient, appliance concealing furniture, with each piece becoming a point of the triangle. For example, a 3 piece YesterTec kitchen may have a separate range piece, a sink piece, and a dry and cold food storage pantry piece. The sink and range pieces are each 30″ deep, making the counter tops and full-extension drawers 5″ deeper than normal cabinetry. The storage areas above are 18″ deep instead of 12″ deep. 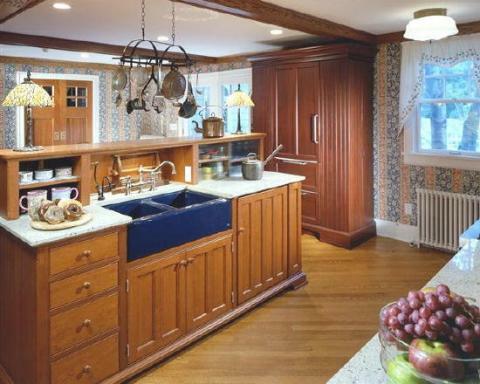 An island sink piece may have a room divider piece on top to separate the work area from the family area. It has an extra 12″ deep work surface, and at 14″ above the countertop it is close enough in for the cook to use as extra work space. The food storage pantry integrates full height and depth storage (all within the reach zone) next to built-in refrigerators. Sometimes wall ovens are even concealed in these pieces. But each piece is a point of the triangle and each is more efficient than standard cabinetry, thus eliminating the need for more cabinetry and counter tops running between the points of the triangle. Note the all-in-one cold and dry food storage armoire combined with ovens that can be concealed behind YesterTec’s patented pocket door system. A walk-in pantry can be another solution to increase the efficiency of the triangle. If the door to the pantry is located in a space between the three points, it can reduce the need for endless runs of exposed counter tops and cabinetry between the triangle points. The walk-in pantry can even contain a refrigerator or range and act as a point of the triangle itself. Thus, only two workstations or triangle points need be exposed for the smallest of kitchens. 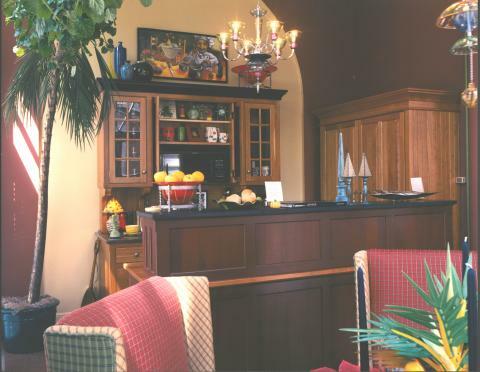 For larger kitchens, this technique can also create more opportunity to add other workstations such as large worktables or even a working pantry, which is an armoire that hides a countertop and all the small electrical appliances. 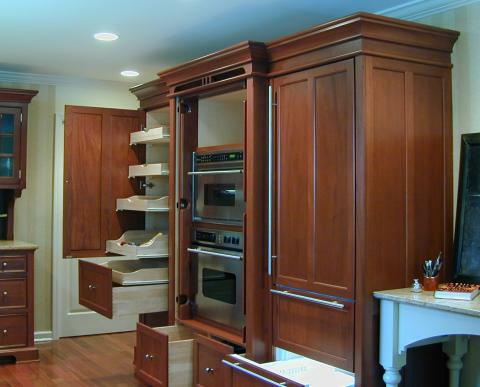 Even with these extra workstations, the walk-in pantry allows the kitchen to remain a tight manageable size. In our largest kitchens it seems that islands have become more like small continents as their size has grown to enormous proportions. Therefore, it is important to make the island as one of the triangle workstations, so the other two workstation/points can be located on one side and one end of the island. Then the areas on the other side of the island can be used for an eating counter, a buffet or simply act as the buffer zone between the family area and the kitchen. In kitchens that need to accommodate more than one cook, congestion usually occurs around the sink area. So a fourth workstation, a prep sink with a worktop, can turn a simple kitchen into a workhorse. In this example, the prep sink is built into the end of the island in front of the refrigerator/freezer/dry goods armoire. Slightly wider isles help as well, but the efficiency of the other 3 workstations allows the triangle to remain intact. Super-sizing the appliances by using 6 burner stoves with multiple ovens and using 4 to 6 foot wide refrigerators can make each workstation more efficient if the size and complexity of the meal demands it. But for most families, the smaller, standard sized appliances are sufficient. Perhaps the biggest misconception about the work triangle is that there always must be specific lengths between its points, or exact amounts of storage and counter space that are required. In practice however, the triangle is simply an organizing tool that can be used to help make kitchens more usable. With the diverse lifestyles, family structures and other social and physical factors that can affect the design of a kitchen, there clearly are no exact rules. But as an organizing concept, the work triangle is here to stay, and making its points more efficient is one of the best ways to turn a beautiful kitchen, of whatever size, into an pleasurable cooking environment as well. Next ArticleThe Great Room (finally) has a New Choice! Previous ArticleSalt Box Style Home Furnishes the Kitchen!